Continuing their run of getting absolutely phenomenal acts into the studio, Triple J had Pluck favourites Jonathan Boulet (or, as they shall henceforce be known, Jonathan Boulet And The Groovy Kangaroos) this morning liking a version. The band played their original track North To South-East To You, which I was initially disappointed with, having hoped for ACSA or Ones Who Fly… However they messed around a bit with the track, and I actually really liked it, far more so than the arrangement they have been playing at live gigs. Then it was time for the cover, and Jonathan chose Eddy Current Suppression Ring’s Colour Television. It was an interesting choice because ECSR’s raw music is the polar opposite of Jonathan’s clean-cut pop music. However to their credit Jonathan Boulet And The Groovy Kangaroos pulled it off excellently and it was yet another great Like A Version cover. 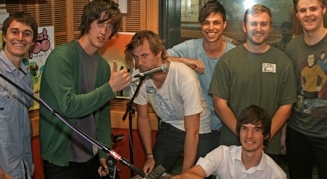 So once again, head over to Triple J to listen to and download the segment.